Plans are already underway for our 2012 Spring Musical. 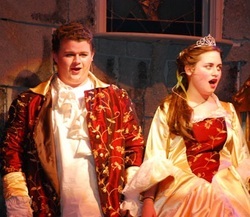 As we did with Les Miserables in 2006, Miss Saigon in 2008, and Beauty and the Beast in 2010, the cast will comprise the third period Concert Choir. Imagine yourself a student in Concert Choir as we get ready to begin the musical. We begin learning the chorus numbers in class in the Fall, and also hold dance auditions early on. As the chorus numbers are learned in class, the major and minor leads' songs are introduced. Usually around late November, the exciting days of lead auditions are held. Auditions are done in class, and sometimes as many as 25 students will be vying for a role. We wish we could pick them all! After winter break, rehearsals move to the District Auditorium and the real work of blocking the scenes on stage begins. At the same time, any students who have opted to be on the technical crew instead of the cast begin working out lighting, microphones and sound, curtain cues, and assisting scenery construction. Costumers, hairdressers, and makeup artists, supplemented by lots of parent volunteers, roll into action. Opening night is in February, and follows an intense week of rehearsals with the professional pit orchestra, the technical crew, and the directors. Class time during the two weeks of performances is composed of giving notes to the cast and crew, and pickup rehearsals to keep the cast fresh between weekend performances. If you ask any of our Concert Choir students, they will tell you that the whirlwind of January filled with rehearsing, late-night burritos brought in by parent volunteers, and oh yes -- doing homework out in the auditorium seats or our tutoring center between scenes -- are one of the busiest times of their lives, but also some of the most memorable times in high school. We'll announce our musical soon! Concert Choir, we'll see you under the spotlights!